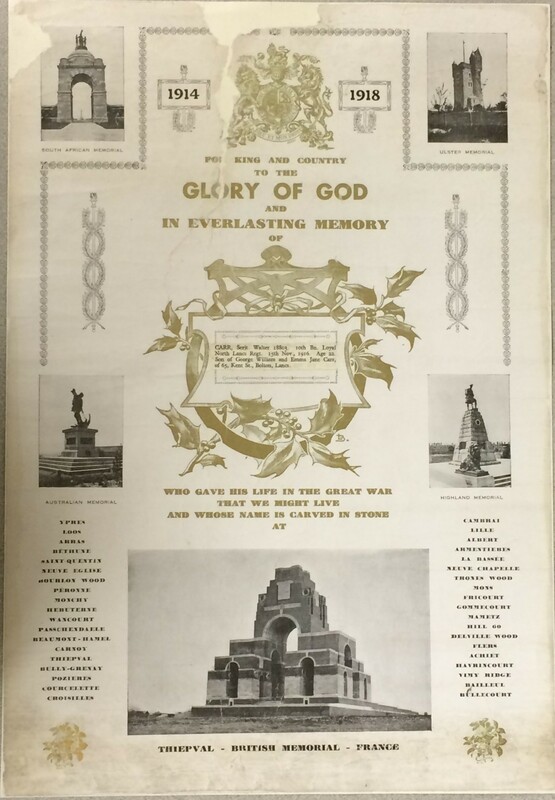 Within the collection of Bolton Archives there is a copy of a large certificate known as the “Golden Roll of Honour.” It shows an image of the Thiepval Memorial, which was unveiled on 1st August 1932 by the Prince of Wales. Images of the memorials of the South African Memorial; Ulster Memorial; Australian Memorial and Highland Memorial also appear. The certificate was produced to commemorate the death of Sergeant Walter Carr who died at the Somme and his name appears on the memorial. Margaret Koppens carried out research at Bolton History centre to find out more about the certificate and about the man it commemorates. Walter Carr was born on the 5th October 1894 in Halliwell to George William and Emma Jane Carr (nee Orrell) who had married at Bolton Registry Office in September 1892. Walter was baptised at Bridge Street Wesleyan Methodist Chapel, Bolton (now the Genting Casino). He was the eldest of four boys born to George, a clogger and Emma and before joining the Army he worked as a little piecer in a cotton mill. His brothers were Thomas Rowland, born 27th August 1896 (possibly died in infancy), George William, 23rd August 1898 and Ambrose Orrell, 24th August 1900. By 1901 the family were living at 30 Wilmot Street, Halliwell. Bolton had many cotton mills where children, some as young as 12 were employed and Walter, was one of them. Some were known as ‘half-timers’, which is to say they went to school in the morning and to work in the afternoon. The following week it would be the opposite way around. This of course resulted in many of them being very tired, for the hours were long and they would fall asleep at their desks or when they should be working. Their job was to crawl under the machines spinning the cotton and sweep up all the dust and fluff that gathered there; this was done whilst the machine was running and many children lost their lives or were badly maimed from becoming trapped in the machinery. Later they were shown how to repair breaks in the yarn being spun, this was known as ‘piecing’, hence the title, ‘Little Piecer’. Although they were employed at the mill they were paid their wage, which was probably only a couple of shillings (10p) for a week’s work, by the Spinner who was the man in charge of the spinning mules. Walter enlisted (No.18803) during the First World War and attained the rank of Sergeant in the 10th Battalion, the Loyal North Lancashire Regiment. He was sent to fight at the Somme and lost his life three days before the battle of the Somme, which had been raging since July, ended. His body was never found and he was presumed dead on 15th November 1916. He is remembered along with thousands of others who have no known grave on the Thiepval Memorial. Walter is also remembered on the War Memorial in Victoria Square, Bolton and in the Bolton County Borough Roll of Honour 1914-1918 Book, on page 078. He received the Victory Medal and the British Medal for his service. The Golden Rolls of Honour were produced by Captain Malcolm Cockerell as a private fund raising enterprise after the First World War and sold for two shillings and sixpence each (12½ pence). The certificates were sent, with a letter, to the relatives of the fallen men asking if they would like to purchase the copy. Certificates for other war memorials in France were also produced. The certificate would include the entry from the Imperial War Graves Commission Register with the service information for the soldier in question. Bolton Archive Ref No ZZ/675/1. Walter Carr, World War 1 Memorial Certificate 1916. Further information regarding the Golden Rolls of Honour is available through the following link. Thank you for the information on Walter Carr. He was my father’s uncle and I have only recently learnt of his existence. I have some further information about the family generally and also a photograph which I believe is of Walter Carr.